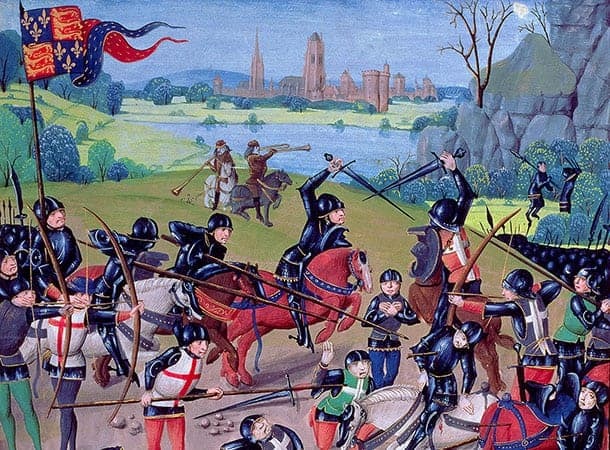 Did your ancestor fight in the Hundred Years War? If you’ve ever wondered whether your ancestors served as a medieval soldier in the Hundred Years War, a newly launched website from historians at the universities of Southampton and Reading may have the answer. They join the quarter of a million names already available for English armies who fought in a number of campaigns, including Agincourt– forming what’s believed to be the largest database of medieval people in the world. This latest stage of the Soldier in Later Medieval England project has been supported by the charity Agincourt 600 and by both universities. Of the thousands of French soldiers added to the new website, 550 were killed on the battlefield. Research by Southampton’s Dr Rémy Ambühl has also shown that over 300 were taken prisoner and held for ransom. The Medieval Solider website was first launched in 2009, resulting from a three year research project funded by the Arts and Humanities Research Council (AHRC). Names of soldiers were sourced from archive collections of muster rolls used to audit pay during military campaigns and from evidence of letters of protection, which soldiers bought from the Chancery to prevent legal actions while they were absent from home. Now refreshed and given a new search interface by Russian postdoctoral fellow Dr Aleksandr Lobanov, the website brings together three separate databases to make them searchable as a single resource. In addition to the names of the French soldiers recently added, the database now also contains details of geographical origins of soldiers and locations of their service – enabling the local life of the medieval soldier to be illuminated more fully. People can search by surname, rank, or year of service. For example, Professor Bell was pleased to find 58 ‘Bells’ on the database, including a John Bell from Chatham serving in Calais in 1414 and again with the royal household on the Agincourt campaign. The site provides biographies of all English captains of 1415 and further insights into the Battle of Agincourt, which was commemorated extensively in the UK and France last year.